Sure, no one was surprised by the announcement of Hitman 2. Brazen or not, IO Interactive had no one fooled; their latest Agent 47-related teases would blossom into a sequel of 2016’s iteration of gaming’s favorite prototypical assassin. 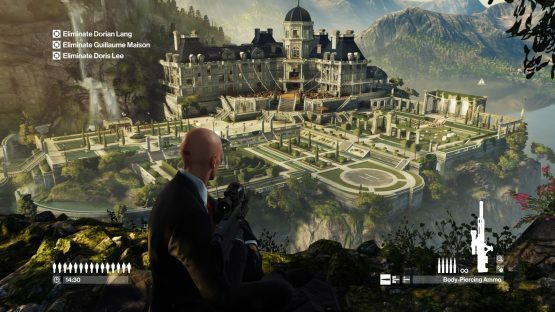 That said, I’m not sure anyone saw coming the inclusion of Sniper Assassin, Hitman 2’s co-op sniping simulator. On the face, the game mode is rather odd. “You mean you’re just sniping?” Not only that, Captain Skeptic, but you actually can’t even move. You’re rooted on a hill overlooking an area of several targets in need of killing. And while my first attempts at the game mode went about as well as could be expected (terribly and without much depth), I soon realized how many layers are baked into what could otherwise have been a low effort add-on. Yes, on one hand, you are “just sniping,” in that you perch yourself up in a luxury sniper’s nest at the start of the mission and only reach the end of the mission when all the bad guys have either died or fled the scene. (For the record, I choose to call them “bad guys” out of a need for the moral high ground, and I won’t be told otherwise). On the other hand, you can do a surprising amount to increase the depth of Sniper Assassin, and you will be handsomely rewarded for your efforts. For the record, while this mode can be played co-op, and that’s nice, I was only able to play it solo, as you need to have a friend online to play with – no couch-co-op. It reminds me of – I can’t believe I’m saying this – Batman: Arkham Asylum, and the Arkham series as a whole, particularly in the leaderboard challenges. A little context, during the days of Arkham City, Arkham Asylum and Arkham Knight, I routinely entered the Top 100 on individual leaderboards, and, as anyone who has taken on those challenges with even a modicum of respect, it requires a lot more than just left and right clicking. Sure, you can beat any challenge simply by using the generic strike button and then the generic counter button. You may even be able to do it without looking by just mashing both, if you’re playing an easy enough challenge on an easy enough difficulty. But completion isn’t the primary goal; it’s maximization. When you start to really get into it, you’ll learn what combos and attacks give you the highest multiplier, so you’ll be able to maximize the points you earn. You’ll learn about the end-game bonuses and look to increase your total further. You’ll then have to apply that formula to constantly changing and increasing challenges (i.e. now there’s a guy with a shield, or a taser that will break your combo if you try to hit them straight on). And, surprisingly enough, it’s the same thing with Sniper Assassin. I haven’t checked up on other impression pieces, but I imagine that many people will miss this aspect. They’ll play through it once or twice (because, as of right now, there’s only one mission available) and say “yup, it’s a sniping simulator,” before sarcastically adding “whoop-de-doo!” or whatever the kids are saying nowadays. You can use this as a litmus test to weed out those writers who failed to rise to the game’s level. Hitman 2: Sniper Assassin challenges you to not merely snipe your foes, but to do so in creative ways. And sure, you can just say “screw it,” and shoot all your targets in vanilla ways, but I hope you enjoy being at the bottom of the leaderboards, because that attitude has bought yourself a one-way ticket. And maybe it does only appeal to leaderboard junkies, but good god is it a compelling appeal. You get points for headshots, consecutive headshots, kills in close succession. Even though you can’t move, you can actually hide bodies by making sure they fall in the brush, off a cliff, through a window to a vacant room, into the water – and you get a hefty bonus for doing so. 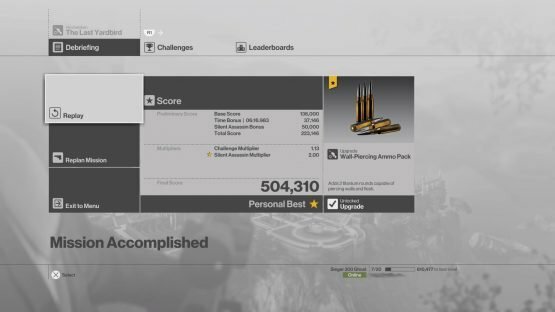 Do certain things enough times (hide a body in a water, kill all the body guards, etcetera), and you’ll earn an end-game multiplier that is not to be underestimated. Kill everyone without raising an alarm, and you got yourself a 2x bonus to your final multiplier (which should help explain why people are breaking into the millions in final score). Watch the video of my playthrough (totally not my billionth time or anything) and see all the bonuses I manage to accrue – it adds up and it’s a gem of a challenge. These are the kind of challenges with purely pride as a reward that might make you say “meh, too much effort,” but, if that’s the case, these types of game modes aren’t for you. But anyone who has been thirsty for these online, leaderboard-focused challenges since the unfortunate departure of the Arkham games to fill that void, Hitman 2 is a must buy, if for no other reason that Sniper Assassin.